The Cricketer has just arrived. #39 last year has not put himself in the list this year. There’s some super stuff in there. #39 emeritus sucking up to the ECB is one. Did I miss something obvious Botham did? Durham figurehead and expensive ‘whine’ provider? Ok, so, becoming figurehead of the definitively least powerful county in English cricket gets you a 13-place bump? 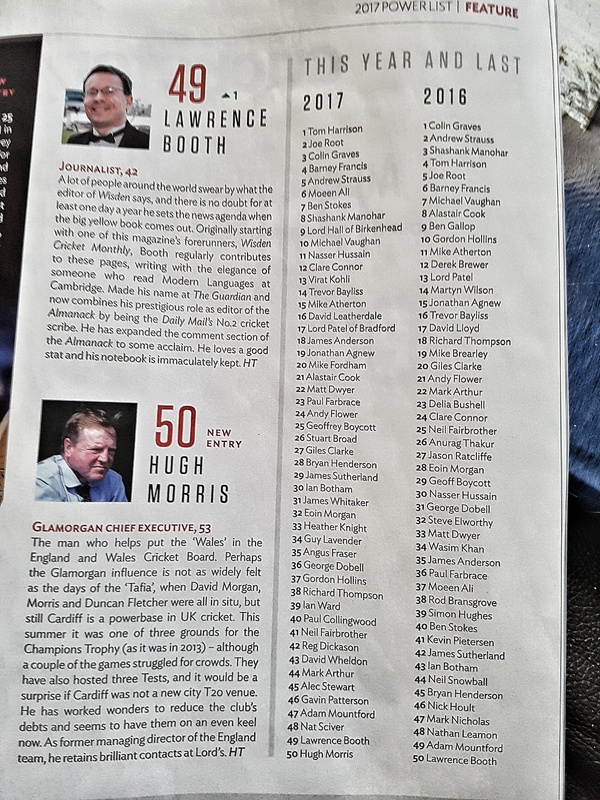 Hughes leaving himself off the list this year is shutting the stable door when the horse is over the hill and far away. Andy Flower at #24 and Giles Clarke at #27. Yes. of course they are…. That is why Hughes will for ever be known as 39 for me. When he wrote the ludicrous boast last year he really believed it. He had no self awareness to realise what a pillock he was making of himself. The fact he has removed himself this year is proof. Either that or he has done such a lousy job this year as 39th most influential person in English cricket that he has disappeared from the list. In which case he should sack himself!! Do share more! I can’t believe the they’ve done it again and led to one of the most memorable posts on these pages (although the Christmas Carol is still my favourite!). Boy they really hate Durham down at ECB towers. Relegate them, deduct points from them, give them a useless 20/20 in mid September, and if that wasn’t enough……. drop the local lad and hero. You could not make up a bigger scenario in which they say F*** you to Durham, and their fans. There is no sport in England that hates it’s fans (sorry customers) more than English cricket. The feeling is mutual I can assure them. One of their favourite sons has just been paid 75k to bowl two overs though! I don’t suppose it escaped anyone’s attention last week that Bransgrove was rewarded with a second consecutive Test v India in 2018, and the two remaining venues north of Nottingham make do with a T20 and an ODI. But you may not know that, of 17 Tests India will have played here since 2002, only one was played north of Nottingham. The Indians have played at Lord’s, Oval and TB in every single tour in the 21st century. Wasn’t it Manchester that Sachin introduced himself to an English & world audience with his first test hundred at 16/17 in 1996? Don’t want any more of that nonsence!! Good job cricket has advanced since then. Rod Bransgrove drops out, I believe, from 38 (one above our main man). So Hughes’s list works just like the honours system then! And then there are the Editor’s Notes. Some egos didn’t need inflating, did they #39 emeritus? Here’s a little quiz question. 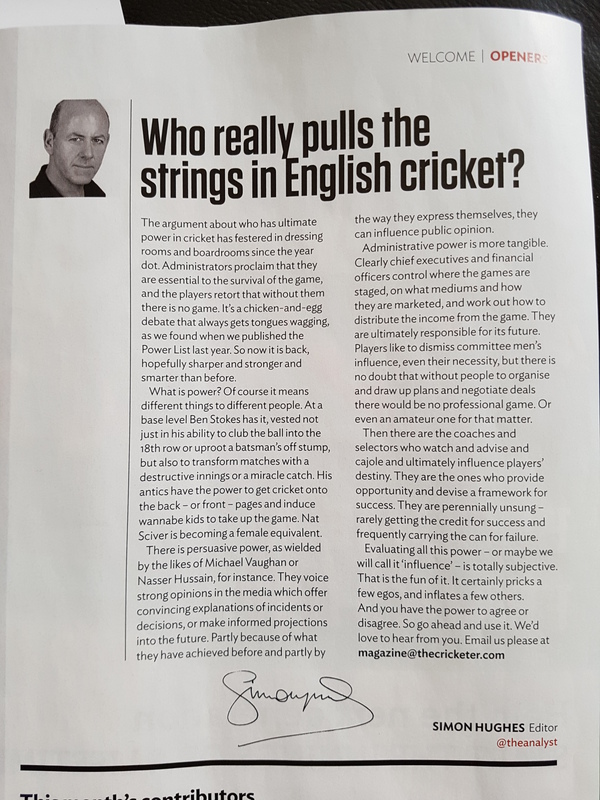 In this month’s Cricketer who said this about who? I’m going Occam’s Razor with my first bid and saying Selvey on Flower. You’d never guess that Selfey would devote a whole page on the Pakistan matches, would you? A massively important step forward, bringing cricket back to a cricket loving people. Which had to be shifted to avoid a clash with the Caribbean Premier League finals. History is nice, but money is money. Insufferable. I have to say I never knew about Flower’s humanitarian work, and if anyone was going to tell us before surely it would have been his leading courtier. Surely he doesn’t just mean the black armband gesture that was so much easier for him to leave behind than it was for Olonga? Oh good, the Rose bowl can give Cook another 3 hour standing ovation for not scoring a century. Actually, if the last 2 series against India in England are anything to go by a home test against India is not a great spectacle. The ODI games will likey be more of a contest. Where is Bransgrove on 39s little list? Ah, he’s dropped off altogether (I couldn’t see all of it on the view I was looking at). He really doesn’t like Lawrence Booth, does he? Was it because he dared to criticise Hughes’ beloved Giles Clarke in public and isn’t signed up to the Ashes/T20/nothing else vision of world cricket? It really is the most insufferable of circle jerks. Hugh Morris? Stop laughing at the back. It is probably one of the most pointless lists in history. But by making it, and elevating it in his own magazine it becomes all about 39. Even Lizzie is looking out for it. If only for comic value. It caused a ripple last year. They brought John Etheridge on to the panel to give it some gravitas. It pricked egos. It was comedy effing gold. It produced a ripple of hilarity. We loved it. Articles write themselves. At 38 it’s Richard Thompson. Is that the same Thompson who was in Fairport Convention? He is one of the worlds greatest guitar players, but top 50 important cricket figures?,He loves cricket, and was was interviewed by Agnew a few years ago, but really? Perhaps there is another Richard Thompson? At 13 is Virat Kholi. Which is interesting seeing I thought it was an English list. 39 trying to pander to the Asian vote I suspect. He has Mooen Ali at 6. Nice guy, but 6th most influential? Michael Vaughan, Nasser, and Clare Conner come in ahead of Trevor Bayliss. That’s got be Slightly worring. Atherton comes in behind Nasser and Shinny toy. That can’t be right. 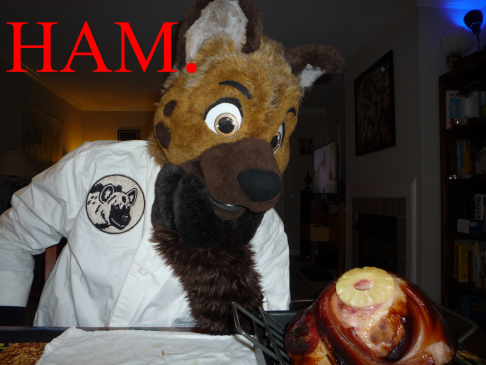 Its a bit of a dog’s breakfast. In today’s world of test cricket fighting for survival, Roy Harper’s “When an old cricketer leaves the crease” could not be more apt. Be glad if it’s a musician – not too bad a musician either. SA’s list would be filled with corrupt politicians. They just have to be involved everywhere. To play devil’s advocate, I’m not busy today and I wouldn’t mind putting on 4 cardies and watching Gayle, Lewis, Narine, Hales and Roy do their thing for a few hours. However, it does feel like Lords, the Oval, Headingley etc get treated to a 5 course meal while Durham get a burger and fries. Mind you down here in Sussex or in the new champion county, you don’t even get a sausage. Thinks: missing a T20, where you’d bowl 4 overs and potentially only bat for 5 minutes doesn’t strrike me as much of a rest. Missing a 50 over game or two would seem more beneficial. Virat Kohli? 13 in an english cricket power list?? or is this for the entire world? The good thing is that he got the spelling right. Too many people still write kholi. :-). I guess they must be following a rose smells just as sweet saying. Oh look, it’s Ski Sunday. No it’s not ….its cricket. It was the St Ledger today. Last big flat race of the season, and we are starting a cricket competition. Should be fun!! You have to hand it to the Durham faithful. They have turned out in numbers. Then again it beats Christmas shopping. Whatever we think…. This is what the public want. They can’t get enough of it. The commentators are all wrapped up in blankets now. Should be lovely in about an hour! WI making a mess of this. What once looked like 200 is now struggling to be 170. Shame Rashid didnt play in the test match at Leeds on the last day. But Nasser informs me he’s a 20/20 bowler. Cold and wet. The perfect combination………for football. Off for rain now. 167/8 with an over to go. I wonder if Sir Ian Botham is there? September evenings are always pretty cool. Might have made more sense playing it in daylight hours, but, of course, the great god football is in the way. England pulled that back, but West Indies gave it away. That Gayle run out was schoolboy stuff. Club cricket (bad) stuff. Going to try a little Over by Over on this game. It’s something we are thinking of trying on some occasions. Maybe during the Ashes? I’ll do it in the comments today. Pre-game – first query. Do you think Simon Hughes wrote the lines for the Kia adverts? And why does he remind me of Nick Knight. 0.1 Willey swings it, and Gayle nicks it through the slips for 4. Hussain is pants on fire enthusiasm as if this is some great world affair, rather than a knockabout. Lloyd telling us it’s going to be a lot of fun. More promoters than commentators. West Indies shirts remind me of some Northampton Town cast offs. 1.1 Joe Root on in a reprise of the World T20 Final. 3 dot balls to Lewis with the third nipping back a little into Lewis. The fourth was belted over cover for 4 as Root gave it some air. The boundary was the only run making shot in the over. 2.1 Willey bowls again. Two dot balls to start the over. The next 6 will be his hundredth apparently, and then, on cue, he hits the third ball over midwicket for six. The next one gets belted straight over long off for another six. Bumble gets someone who is obviously listening to TMS rather than Sky so we don’t get a reprise of his tiresome talk to a supporter twaddle. 13 runs from the over. 3.1 Tom Curran on and starts with a nice straight one to Gayle which he defends. Second ball gets belted over long on for another six by Gayle. Hussain wants TC to hide it outside off stump. 4th ball of the over goes for 4. Gayle looks to move down the pitch, TC bowls it short, and Gayle lofts it over square on the offside for 4. Lewis miscues last ball of over, for what looks like a 4, and it’s confirmed as such. 4.1 Chris Jordan next into the firing line. Gayle a bit uppish to the first ball, but gets a single to long on. Second bull full toss gets walloped through cover for 4. Gayle lofts the fourth ball over extra cover for a one bounce four. Last ball of the over is massacred over extra cover for 6. That tree trunk swung to great effect. 5.1 Tom Curran finds his first ball dispatched over his head for a six by Lewis, and the next is flicked slightly behind square for 4. Third ball elevated, looked like it might be a catch, but sails over the Bairstow’s head for 6. A single from the remaining three balls. 6.1 Powerplay over, Liam PLunkett on. First ball flicked down leg side for four by Lewis, who is catching Gayle. Is this a run out? Gayle runs like I do, and is run out and goes for 40. Lordy, I’ve seen glaciers move more quickly. In comes Marlon Samuels. That run out is even worse on second look. Schoolboy ball-watching, as he prodded it into the offside. Jason Roy did well, but Gayle’s atrocious there. Samuels off the mark off the last ball. 7.1 Rashid on. Samuels prods the second ball for a single. Third ball is hit over extra cover for 4 by Lewis. Ambitious LBW appeal on the 4th ball. Still no 2s in the innings. Last ball hit over extra cover again for another 6. It wasn’t particularly well hit, but that’s the modern game for you. 8.1 Plunkett bowls his second over and starts off with a bouncer. Three dot balls to Samuels. Bowls a rank ball fourth up and Samuels puts it away behind square on the offside for 4. 9.1 Joe Root back on for his second over. Wide off the second ball, single off the third to Lewis. They might be moaning about the cold in the com box, (Lewis completes his 50 in 26 balls with a single), but you are being paid fellas. Poor sods who paid for the tickets…. Root bowls another wide in a quiet over that went for just 7 runs. 10.1 With the first ball of the 11th over, Lewis smears a ball to Joe Root, not getting the elevation or placement and Root takes a reasonably routine catch at mid-off. In comes Chadwick Walton. Walton gets off the mark first ball, as brother texts me to tell me Harry Redknapp has been sacked. Walton’s second ball goes over long on for another 6. Lordy. Similar mishit to Joe Root who is mid-on to the right hander as opposed to mid off for Lewis. Looped more than Lewis’s, much more simple catch. In comes Kieron Pollard. No clue what happened there – Pollard not ready? Nonsense. Pollard gets off the mark with an unconvincing prod. 11.1 Rashid back on after going for a dozen in his first. 2nd ball is flicked leg side by Pollard for 4 to a very fine leg. David Lloyd has his cup of tea. Bet that didn’t cost him £2. Quiet over as Pollard plays carefully. 12.1 Plunkett back for his final over. Beloved just texted me a picture from a New Jersey beach. Short ball, pulled with what looked like a miniscule effort but carried almost to the boundary as Curran takes a decent catch above his head at deep backward square and keeps himself inside the ropes. Plunkett’s third wicket. Rovman Powell in next. Got to say I don’t know a lot about him! He gets off the mark on his third ball. Has a highest T20 score of 44. Walton takes a single off Plunkett’s last ball, and Liam ends up with 3/27 in his four over spell. 13.1 Rashid starts his third over, Walton lofts into the midwicket area, and that might be our first 2. Nope. Just a single. 3 balls into the over, and two singles only. Rashid bowls a filth ball, Walton top edges the ball out to deep midwicket and Willey takes it. England getting back into it. Here comes Stokes killer Carlos Brathwaite. Good over from Rashid, just three from it. 14.1 Jordan back on after an early horror over.Powell takes a two. Wow. Nicks the next one to third man for 4. West Indies need a decent finish, you would think. 8 off the first four balls, Brathwaite off the mark. He goes home after this match (not playing ODIs?). Seems extraordinary. Said the are cricket’s equivalent to Fiji. First ball of the over, Rashid bowls a straight one, Brathwaite goes too far across and is bowled behind his legs as he tries to sweep. Remember the name. Sunil Narine comes in and leading edges his first ball for a single. Tempo dropped, and West Indies a bit bogged down. Big shots drying up, as Rashid bowls his last ball and…. 16.1 Curran back, Ashley Nurse is the new batsman. Powell takes a single off the first, Curran beats the bat with the second. A horrible wide off the third – Tom did this for the ‘rey this year and his rep as a death bowler is a little overstated. Nurse off the mark to a slower ball. Last ball is belted hard, but just for a single to deep square leg. 5 from Tom’s third. 17.1 Jordan starts his third over with a wide. Boundaries drying up. Nurse hauls the second ball for a single to square leg. Another wide. Jordan not impressing here. Rain alarm says there isn’t a lot of rain around CLS. Powell smashes a six off Jordan’s slower ball to break the shackles. 9 off the first three balls. LBW appeal off fourth legal delivery is turned down (given as a run – didn’t look like he hit it). Single off the last ball. 18.1 TC on again. Rain falling. Plunkett drops a difficult chance at long-on from the opening ball of the over. Nurse gets a single. Loopy full toss goes for 6 as Powell smashes it over square leg. That’s a bit Jade. TC gone for 44 off 3.2. Curran gets Powell to miscue, and the ball goes a mile up in the air. Chris Jordan peers through the gloom and the heavy rain to take the catch comfortably. I say that, it must be like a bar of soap. Taylor in next. Gets off the mark first ball, as Nass lapses into “they’ve all got natural ability” drivel. And with that the umpires have taken the players off with 18.5 overs and the score 167/8. That’s been hard work! Any feedback welcome. At least test cricket might be more sedate! Some comments. The Ward / Key combination on commentary was just the ticket. Enthusiastic without being pants on fire. Informative without being over the top. I moan a lot about commentators but they were brilliant. Take Key away from Freddie and he’s really on his game. On Chris Gayle “to be honest” watch. They are coming back out. I can’t continue because the Beloved is ringing me! I like the idea of interactive feedback amongst friends. How about posting after each over or two? It could be easier to get different threads and ideas developing. You could also more easily outsource in the middle of the night during the Ashes (though I realise that this form of commentary could very quickly go off-reservation and you’d get twats like me posting in their own versions of events). Anyway, I’ve not followed the match at all except here, so that’s one more vote for non-mainstream media! No other blog I know of in England did match threads. We set the tone on HDWLIA and BOC for that. We would probably do the OBO on key dates – weekends, maybe the first day of the Ashes. Might not be all night but it’s something we are looking at. I’m relatively confident everyone knows what they are doing here, and if we get newbies, all the better. I’m confused. Does this make Rashid – after his poor county season – officially a ‘big game’ player? Does it get any bigger than this, according to the ECB? And that is why anyone who thinks Roy should open in test cricket is smoking some strong stuff. The lobby for Roy earlier this summer wanted him at No.5 which is where he’s been batting in the CC. Nobody’s been arguing he should open in Tests that I’ve seen. Have you ever heard Peter Kay do his bit on DJs at weddings? You can’t understand a frigging word they are saying. Sounds like they have that DY here. You really do wonder. When are the lions coming? Urgent! Calling Quebecer! Are you watching?! When they invented 20/20 they claimed it would be quick and easy. They would speed it up. I see now it has managed to copy the glacial pace of test cricket. Call with the Mrs lasted nearly 50 minutes. Had 6 overs and a 10 minute break. 6 overs in 40 minutes. I know boss. People strolling on and off the field. New batsman ambling on. How long before they can’t get the 40 overs in on time? Then the authorities will give them an extra half hour. No-one cares about catching the train home. Also, not the first time David Lloyd appears to be talking with his mouth full. The good news is that Bumble has recovered from frost bite. Whatever they put in his tea seems to have solved the problem. Bumble is doing his Captain Oates routine now.,…. Bloody hell, I’m bored. This is drivel. This is our future. Enjoy it. Yes. This is the two World Cup 20/20 final teams. If you didn’t enjoy it , this is the best they have. Packed it in. What happened to our raison d’etre of putting the foot to the floor and damn the consequences. That was timid guff, Hales excepted. They are building, building, building. It took almost as long as a days test match cricket. On a serious note. Well done to Brathwaite to have kept his team on the field and a well deserved victory in alien conditions. That the two successes happened basically in the first 8 overs of the WI innings had a lot to do with how it all went down. Well I never, look who’s the new cricket correpondant at the Observer…. (okay, it could be worse and it’s not Pringle). By the way, in all the blaming of resting Stokes and Ali for the defeat (and I agree resting the former for this particular match was atrocious PR), nobody seems to have noticed that England had 9 members of their T20 Final team playing compared to West Indies having just 3 (Gayle, Samuels, Brathwaite). Two, perhaps three, of that Final team would be no longer worth their place on merit (Lewis for Charles, Narine for Benn, perhaps one other) so this is essentially a half-strength West Indies’ team in T20.